I am using Samsung Note 5 SM-N920G (Andriod version: 6.0.1 )Mobile with T-Mobile network. 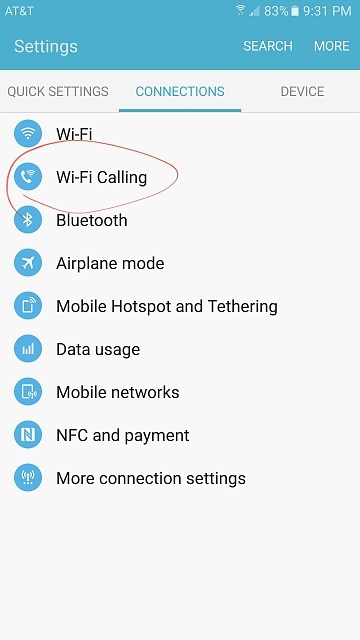 My Mobile Network support Wi-Fi calling but that option does not get list up under more connection settings. Do you have WiFi calling turned on in your phone settings? Yes its connected with WIFI. Open you phone app, in the upper right corner select "More". When the drop down menu appears, scroll down to the bottom and make sure WiFi calling is turned "On"
No luck, please see screenshots. Yes its not getting listed, but i am able to see& enable this option on my other device (iphone) using same number. what is OS version and model number of your device. I am using a N920A 6,0,1 on AT&T. It may be that you need to upgrade your Sim card to take advantage of the WiFi calling feature. T-Mobile has had WiFi calling for far longer than AT&T. My fingerprint scanner on Redmi Note 3 Pro not working. How to create a dial shortcut on a Samsung A5 screen?